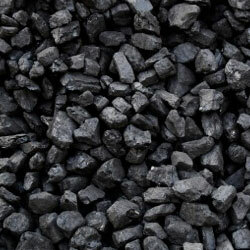 Coal and other fossil fuels are like carbon stores where a lot of carbon dioxide was deposited millions of years ago. When we burn coal (or other fossil fuels) we release this carbon back in the atmosphere as carbon dioxide and carbon monoxide. You should only burn coal in a multi fuel stove in which there will be a grate. Nearly all multifuel stoves are designed to burn wood, coal, peat and other fuels. The grate in a stove is made up of bars of metal and the gaps between the bars let air from below get to the coal. You need to make sure that the grate remains unblocked and that the ash in the ashpan does not come too close to the bottom of the grate or it will restrict the flow of air to the stove and your grate may get too hot and become damaged. It is not recommended that you burn wood and coal at the same time: burning coal produces sulphuric acid and wood can contain a lot of moisture - this combination can coat your chimney in a sulphuric acid solution which can cause corrosion and damage to appliance liners. Always ensure that your chimney is swept at least once a year. A clean flue is a safe flue!